When a water leak impacts your business, or you discover house flooding issues, the property becomes susceptible to becoming affected by mold within 24 hours. 911 Restoration of Miami completely understand the importance of providing quick and efficient mold remediation services after water has invaded your home or business because unmitigated water issues easily lead to mold growth. To make it easy for you to receive mold cleanup in Miami, the technicians provide property owners with free visual mold inspections so that they can come up with a mold restoration strategy immediately. The mold experts take all incidents involving water very seriously because they understand how much damage water and mold can do when left to sit on the surfaces of the property. Not only can mold and fungus compromise the structural integrity of your property, but it can also affect the indoor air quality, which can harm your health. When you need Miami mold specialists, you can rest assured that the team at 911 Restoration will arrive quickly to begin cleaning mold from every corner of your home or business. 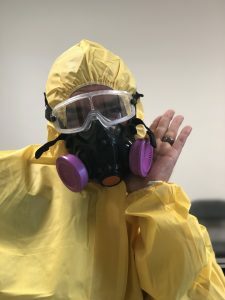 The customer is the main priority, and technicians will go to great lengths to make sure that you are kept safe from the harmful effects of a mold infestation. 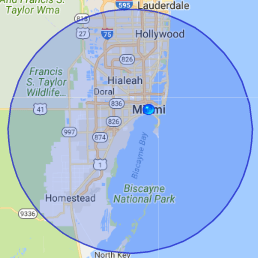 So, call 911 Restoration of Miami as soon as you notice signs of water damage or mold in your property and the technicians will do whatever it takes to make your property safe and clean again. When you do not regularly maintain your plumbing system, then it can be a significant source of causing mold. Fortunately, the mold experts are well-versed in repairing all types of home water leaks, and they will be able to handle everything thrown their way. The technicians always implement fast mold remediation in Miami to prevent further issues from occurring from the high moisture content that is in the air. 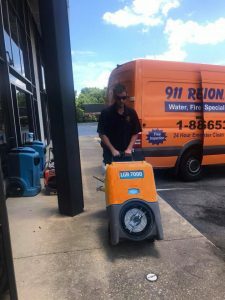 Along with providing mold cleanup, the pros get to the job site immediately so they can start water removal and drying services since mold is typically the result of water damage. By administering speedy water damage repair, we significantly reduced the amount of time that your property has been exposed to moisture, which translates into mold prevention. Another reason why we act so quickly is that inhaling mold particles can potentially cause allergies and respiratory issues. 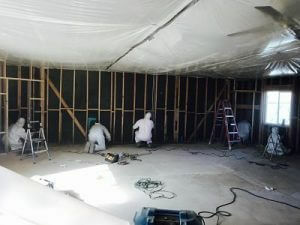 The faster the mold remediation is conducted, the quicker we can ensure that you are breathing in clean air. Call 911 Restoration of Miami immediately upon noticing a leaky pipe or water stains on your ceiling, and technicians will stop the leak and perform any mold cleanup services needed to give you the peace of mind you need. When you hire our technicians, you can be sure that we always prove to our customers that they have employed the most qualified restoration company in the industry. The mold experts do this mainly by being constantly accessible to answer any questions the customer may have, on or offsite. By keeping informed about the mold cleanup process, you will feel comfortable from start to finish. We are here to keep you safe, as well as help prevent future instances of mold and water damage. The best way to stop mold from growing is by maintaining leaks as soon as they pop up, no matter how little they may appear. The repair techs can’t emphasize enough how important it is to keep away from the affected area when there is a mold situation in your property, because certain types of mold are more dangerous than others. To determine exactly what species of mold is in your home or business, the technicians will take professional mold samples and send them to a third-party laboratory where they will be tested. The mold experts want to make things as easy as possible for you and your family, and by providing you with excellent customer service they hope to turn you into a satisfied customer who feels bright about the future of their property. With so many years in the industry, the entire operation knows how important it is to get you affordable mold remediation services. The last thing you want to worry about when you are amid a mold infestation is your finances. Doing whatever we can to get you affordable, quality mold and water extraction services are crucial to us, so you can count on the staff members to make that happen. So, call 911 Restoration of Miami the moment you discover mold in your property and the technicians will turn that infestation into a Fresh Start today!